Do You Want to Commute to Boston on the Commuter Rail? Are you considering buying a home on Boston’s North Shore? The MBTA commuter rail is a real asset to the communities North of Boston. We often have real estate clients follow the train line and choose communities they feel are accessible to it. 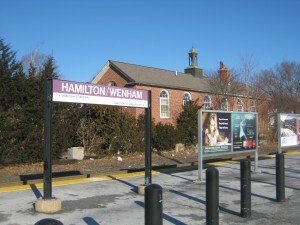 When we list homes for sale in Hamilton & Wenham many people come to see them that currently live in Boston and the surrounding area. They want to move to the north shore and like the convenience of using public transportation. The MBTA has added WIFI service and many people are taking advantage of their commuting time to work. A convenience the car cannot, or maybe should not, provide. An easy trip to Boston or any of the other towns on the line, for pleasure is an attraction as well. Some look for homes that enable them to not have a car or leave their cars at home. For those that would like to drive there is an expanded parking lot at the Hamilton Wenham station. The Hamilton Wenham train line is located right in downtown Hamilton with a shopping area that includes a market, many service businesses, drug stores, small shops, restaurants and more. Making it a great place to take off and land. Grab a cup of coffee on your way, stop at a restaurant on your way home or get a few errands done without an extra trip. There are many options for train service on the North Shore and if that is appealing to you we can help you find an option that works.